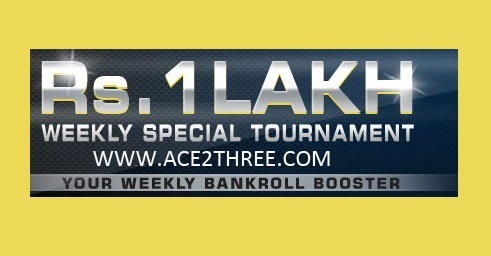 Make yourself free this weekend as Ace2Three is giving you a chance to win a huge cash prize of up to Rs.1 lakh. Show your rummy skills this Saturday, 23rd August at 3 PM and end up being a lakhpati. Haven’t registered with Ace2Three yet? Do it now to get a bonus of 100% up to Rs.1000 also. So, it’s going to rain cash this weekend if you love playing online rummy tournaments. How to Register for Special Rummy Tournament? Getting your seats booked for the rummy tournament is as easy as 1,2,3..
Click on the Register button marked green in color. Confirm and verify your seat by clicking “Yes” on the pop-up dialogue box. Hope you win thousands and lakhs of real cash by playing on this special rummy tournament. Do check out our Online Rummy Reviews to read the latest reviews on biggest online rummy websites and promotions. Also, feel free to write your feedback and suggestions in the comment section below.